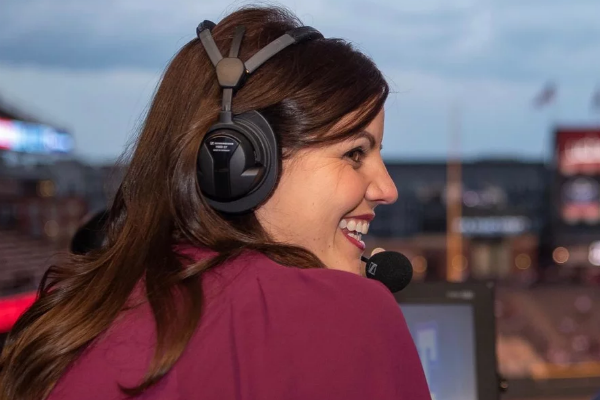 Jenny Cavnar became the first woman in 22 years to handle play-by-play duties in a regular-season Major League Baseball game when the Colorado Rockies hosted the San Diego Padres on June 23. The game aired on AT&T SportsNet Rocky Mountain. Cavnar previously served as a color analyst on radio and as a pregame/postgame host for the Rockies’ broadcasts. She is the first female television play-by-play announcer for a regular-season game since Gayle Gardner called Rockies-Reds in 1993. Kaitlin Alexander, a 2017 AWSM Scholar and recent University of Florida graduate, joined WALB-TV in Albany, Ga., as a multimedia journalist. Autumn Allison was among the AWSM members who earned top 10 honors in the Associated Press Sports Editors (APSE) contest. Allison, who recently joined The Tennessean (Knoxville), was honored for short video. Nancy Armour and Rachel Axon, sports reporters at USA Today, were recognized for investigative reporting. Newsday columnist Barbara Barker was part of a team honored for short video. Pittsburgh Post-Gazette reporter Elizabeth Bloom was part of a team honored for multimedia coverage. USA Today’s Christine Brennan, AWSM’s first president, was recognized for column writing. Oklahoman sports columnist Jenni Carlson, a former AWSM president, was honored for feature writing and part of the paper’s team that won short video honors. ESPN.com sports reporter Courtney Cronin was recognized for long video produced during her former job at the San Jose (Calif.) Mercury News. New York Times sports reporter Karen Crouse was honored for beat writing. Nancy Haggerty, a sports columnist at The Journal News in White Plains, N.Y., was part of a team that earned top 10 for projects. Oklahoman sports reporter Brooke Pryor, a 2013 AWSM Scholar, and Jen Smith of the Lexington Herald-Leader in Kentucky were honored for beat writing. Linsey Bahl, marketing coordinator for Fox Sports San Diego, Courtney Bay, multimedia producer for Oklahoma State’s Orange Power Studios and Ann Drinkard, digital media/communications assistant for the Southeastern Conference were among those named to Front Office Sports’ Rising 25 Award class – which recognizes professionals who have achieved a high level early in their careers. Callie Caplan, a 2016 AWSM Scholar and recent University of Maryland graduate, accepted a position to cover high schools at the Dallas Morning News. Courtney Day, a 2017 AWSM Scholar and recent Drake University graduate, accepted a position in athletic communications at Syracuse University. Jenny Dial Creech, AWSM’s president, and husband Daniel welcomed baby Benjamin “Ben” Daniel Creech on April 2. He was 7 pounds, 13 ounces and 21.5 inches long. Creech, a sports columnist, returned to work at the Houston Chronicle this week. Mirin Fader, who recently joined Bleacher Report's magazine as a writer at-large, was selected as a finalist in the Los Angeles Press Club’s #SoCalAwards in the category of online sports news or feature. Kaylee Glyder joined The Identity Tampa Bay as a video producer. She formerly worked for the University of South Florida athletics department. Jane Havsy of The Daily Record (Parsippany, N.J.) won for best deadline/game story in the United Soccer Coaches’ journalism contest. She also received a top 10 honor in the APSE contest’s game story category. HarperCollins will release the first book by Sarah Warren Henning, “Sea Witch,” in July. Henning, a 2001 AWSM Scholar who lives in Lawrence, Kan., is working on a second book, “Throw Like a Girl,” set to be published by Little, Brown/Poppy in 2019. Katie Hewitt was promoted to associate athletics director of external communications at the University of Michigan. Katie Kemmerer, former president of AWSM’s student chapter at Penn State, accepted a position as a seasonal assistant in community outreach with the Kansas City Chiefs. Stef Loh, a former AWSM president, is transitioning to a new role at the Seattle Times – as an assistant sports editor. Katie McInerney, who serves as AWSM’s VP/student programs, joined the Philadelphia Inquirer and Daily News as a sports online producer. She formerly worked as a sports and special projects designer at the Houston Chronicle. Abby Mastracco joined The Record / NorthJersey.com as a sports reporter covering the New Jersey Devils and NHL. She formerly covered the Mets for the Newark Star-Ledger / NJ.com. ESPN analyst Jessica Mendoza co-authored a book with her sister, Alana. “There’s No Base Like Home” is based on the siblings’ childhood softball adventures and geared to girls ages 8-12. Lauren Moore accepted a sports information graduate assistantship with Lincoln Memorial after spending two years as a sports reporter for The Daily Times of Maryville, Tenn.
Kylee O’Connor, president of the AWSM student chapter at the University of Oregon, clocked the second-best mark in Oregon history in the 400-meter hurdles. She also finished third in the event in the Pac-12 championships and sixth in the heptathlon. Nicole Praga, who completed her master’s degree in May at Arizona State, accepted a position in Penn State’s athletics department as an assistant director of strategic communications. Iliana Limón Romero, who serves as AWSM’s VP/fundraising, was promoted to sports content director at the Orlando Sentinel. Sandy Rosenbush – AWSM’s Mary Garber Pioneer Award honoree in 2012 – plans to retire this summer from ESPN, where she is an Emmy-winning news producer for College GameDay. Rosenbush, who joined ESPN in 2008, co-founded the Sports Journalism Institute (SJI) – which welcomed its first class in 1993 and helps women and minorities prepare for careers in sports media. The first female president of the Associated Press Sports Editors (APSE), she previously worked at the Washington Post, New York Times and Sports Illustrated. Brandi Scarber, a 2018 Michigan State graduate, accepted a position as a news producer with WXMI-TV in Grand Rapids, Mich.
Teryn Schaefer, who serves as a host for the PGA Tour's broadcast and digital coverage, married Mitchell Gregson this weekend in St. Louis, Missouri. Megan Smedley, former president of AWSM’s student chapter at the University of Maryland, accepted a position as a reporter with WNDU-TV in South Bend, Ind. ESPN correspondent Shelley Smith won a sports Emmy for outstanding long feature. “Fight On” was based on inspirational Southern Cal long snapper Jake Olson. Smith and Olson were keynote speakers at AWSM’s Los Angeles conference. Former Associated Press sports editor Terry Taylor, AWSM’s 2016 Mary Garber Pioneer Award honoree, was named winner of APSE’s Red Smith Award – which recognizes an individual for their lifetime contributions to sports media. Taylor will be presented with the award on June 19 in Nashville. Taylor, who retired from the AP in 2014, works for the International Olympic Committee as an adviser for the Olympic Information Service. Alex Tekip, AWSM’s internship/scholarship coordinator and a 2015 AWSM Scholar, joined her alma mater – Michigan State – as a communications manager. Tekip previously worked as a personalization editor at ESPN.com. Terrin Waack, a 2016 AWSM Scholar and recent University of Alabama graduate, will join the Tuscaloosa News as a sports reporter after completing a summer internship with the Associated Press in New York. Charean Williams, who covers the NFL for Pro Football Talk, served as the graduate student commencement speaker at South Dakota State, where she also was receiving her master’s degree in mass communication. Send career changes, achievements and milestones to VP/membership Rachel Lenzi.